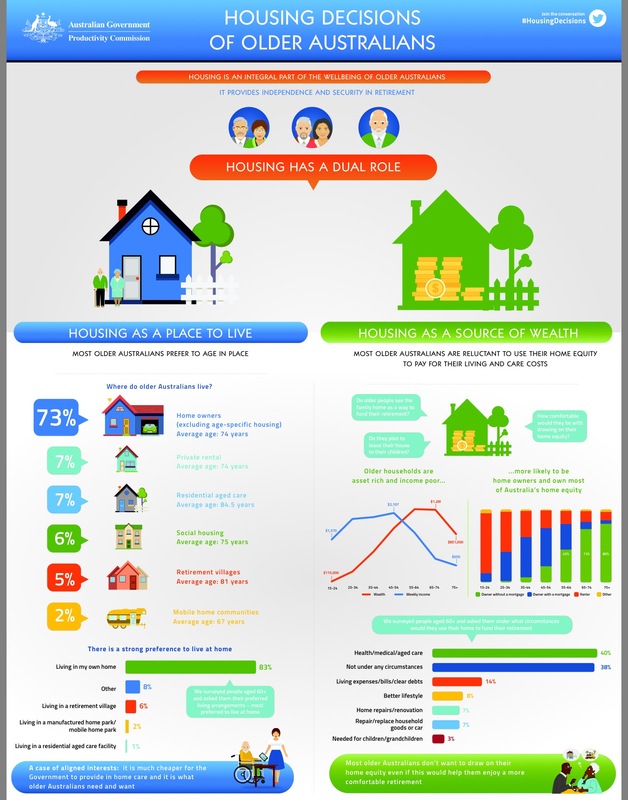 Housing Decisions of Older Australians – Live Long… Live Well! The Australian Productivity Comission has today released it’s “Housing Decisions of Older Australians” report. Housing is integral to people’s wellbeing, particularly for older Australians. For many older people home ownership provides security and independence in retirement. Older Australians strongly prefer to age in place. Most people are happy staying in their family home, despite a common perception that such homes are too big for them. For others, age-specific housing options provide more integrated accommodation and care, offer a way to release home equity, and may delay entry into residential aged care. Growth in retirement villages and manufactured home estates has been strong, despite planning restrictions. Many older people are reluctant to plan or get advice for possible future care and end of life needs. Decisions can be prompted by crises, and made when the person is vulnerable. There are positive signs from the recent reforms in aged care, including improved financial viability, transparency, and consumer sovereignty. However, further reform is needed. About 800 000 older Australians receive home care. Older people’s desire to age in place aligns with governments’ fiscal goals – in most cases, assistance for home care is considerably less costly than for residential aged care. Nevertheless, there may be merit in increasing co-contributions for both home and residential aged care. Most of older Australians’ wealth is in the family home, but it remains an untapped source of retirement income. Many older Australians, including some of the poorest retirees, continue to save (spending less than their Age Pension) even very late in life. The main reasons for such behaviour are precautionary saving and a strong aversion to debt in old age. This precautionary saving is driven by uncertainty around longevity, health and residential aged care needs, and is a potentially expensive form of ‘self insurance’ that can lower living standards in old age. Most providers are diffident due to small market size and the risk of reputational damage. Broader reluctance by older people to tap into home wealth and strong aversion to debt, coupled with the high cost of such products are impeding demand. The tax and transfer treatment of the family home further reinforces this.